HEAVY ITEM. NO CASH & CARRY. WE DELIVERY BY OUR TRUCK. Blower included and requires 16 amp electric supply. Your space travelers, no matter what age, will have a blast in this moonwalk/slide combo. This unit has a covered top for shade. 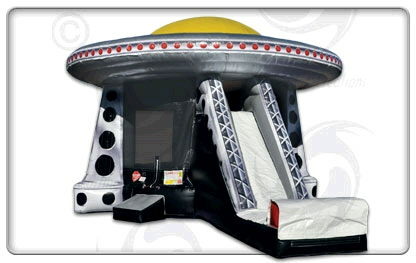 * Please call us for any questions on our moonwalk ufo combo w/slide 25x36x20 foot t rentals in Ft. Wayne IN, Warsaw, Syracuse, Auburn, South Bend, Indianapolis IN.